Jesus was asked by a young man what must be done to have eternal life. Although having kept all the commandments, he still was missing one thing, Jesus said. He instructed the man to sell his possessions, give to the poor, lay up treasure in heaven, and come follow Him. The disciples were astonished to hear such a teaching. It was more figurative than literal, reflecting an attitude of generosity. By choosing stewardship we acknowledge that all comes from the hand of God. And we are free to be wholeheartedly devoted to Him. 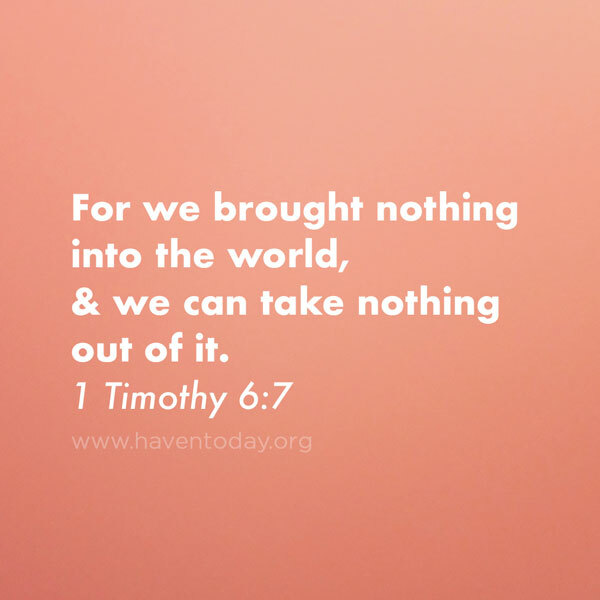 The concept of generosity is threaded throughout Scripture, from various Old Testament stories, to insights in the Psalms and Proverbs about being generous, to accounts of early New Testament believers sharing all in common. In his letters Paul warned that the love of money is a root of evil. My parents weathered the Great Depression. I was taught by word and example that frugality and generosity are not incompatible. We can freely give to others because our dependence is on God rather than on money.